Things that many of us hope for in prayer and pilgrimage, even if we don’t admit it: “quiet peaceful serenity,” “out-of-the-ordinary contemplative skill,” “great mystical insight.” What we often get, instead: “strangeness,” “an experience of Presence that feels more like absence,” and the occasional attack by a charging sloth bear. 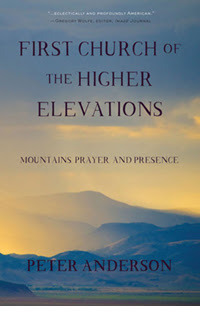 In his essay collection First Church of the Higher Elevations, Peter Anderson summits a lot of literal mountaintops, but this is not a catalog of spiritual mountaintop experiences. Instead, we get honest, meditative essays that reveal prayerful mountain climbs to be something akin to Quaker Meetings: “As space opened out near the high point of our walk, so too, from time to time, an inward way seemed to open, much as I had come to experience in the silence at the Meeting House.” Spaciousness is a running theme here. So is Presence. So is the restless adventuring toward some elusive restful center. Anderson’s insights are always paired with real places. Through these essays, the reader roves across Utah with Anderson to canyons, to tangled green wildernesses, to a high-altitude, back-country abbey. He helps us to see every creeping and leafy thing in these elevated Edens—but he goes to ugly places, too. The Oquirrh mountains, for example, are gouged with the largest man-made hole on the planet, an open-pit copper mine visible from space, and a chemical weapons incinerator. Not the holy place we’d expect—and yet it is the site for one of the most joyful, “grace-filled encounters” of the entire book. Through this book, those readers who can’t climb mountains—but long to—can do so vicariously. Those planning an actual prayer hike might use this book to prepare their souls. And those who are simply restless will uncover here some clue, perhaps, to what our restlessness is for.